Nan-Hui Jo (centre) thanks her supporters moments before she is taken into ICE custody. (Photo credit: Facebook / Stand With Nan Hui). Update (4/29/2015): More details have now emerged on this latest development in the Nan-Hui Jo case. Yesterday, the judge in Jo’s case lowered her child abduction conviction to a misdemeanor and sentenced her to 175 days in jail and three years probation, with time served for the 8 months she has already spent in jail awaiting her trial. Jo was therefore released yesterday from county jail, but immediately into ICE custody due to an immigration hold placed on Jo by ICE and Customs & Border Protection. Advocates say that ICE officers were on-hand to take Jo into custody as she was processed out of county jail following her sentencing. Jo was permitted mere minutes of measured “freedom” in the lobby of the county jail to thank her supporters before she was taken into ICE custody. We will continue to keep a watchful eye on Immigration and Customs Enforcement (ICE) and Customs and Border Protection (CBP), the latter of whom placed an immigration detainer on Nan-Hui to seek her transfer into immigration custody. If Nan-Hui is taken into immigration custody, it could jeopardize her ongoing family court case. To date, ICE has deported over 2 million immigrants during President Obama’s administration. Although the Department of Homeland Security (DHS), the parent agency of ICE and CBP, issued a new memorandum aimed to prioritize deportations, Nan-Hui’s case highlights the dysfunction within the agencies. Supporters are urged to continue to contact ICE by phone to demand that the deportation proceedings be halted. More information on contact numbers and script here. Supporters may also tweet @icegov and @customsborder asking for the immigration hold to be ended, and include the hashtag #StandWithNanHui. You can also sign this petition and donate to Jo’s legal defense fund. In addition, Jo was emotionally and spiritually lifted by an outpouring of letters written to her in the organized letter-writing campaign. However, yesterday she decided to give all her letters to a supporter when she was taken into ICE custody, for fear that she would not be able to keep them with her as she was processed into an ICE detention facility. Therefore, supporters are strongly encouraged to participate in the #DearNanHui letter-writing campaign; please stay tuned to standwithnanhui.org or the campaign’s Facebook page, which will be updated shortly with a new address for Nan-Hui Jo that you can send your letters to. Update (4/30): As one can imagine, there has been information emerging on this story at a frenetic pace. An earlier version of this post contained out-dated information for phonebanking and care packages; those pieces of information have since been removed. Currently, supporters are urged to call ICE to ask that deportation proceedings be halted and for Jo to be immediately released; it is no longer necessary to ask that the immigration hold be removed because by taking Jo into custody, ICE has thereby already acted on the hold. Supporters are asked to sign the petition, and to participate in the following actions. 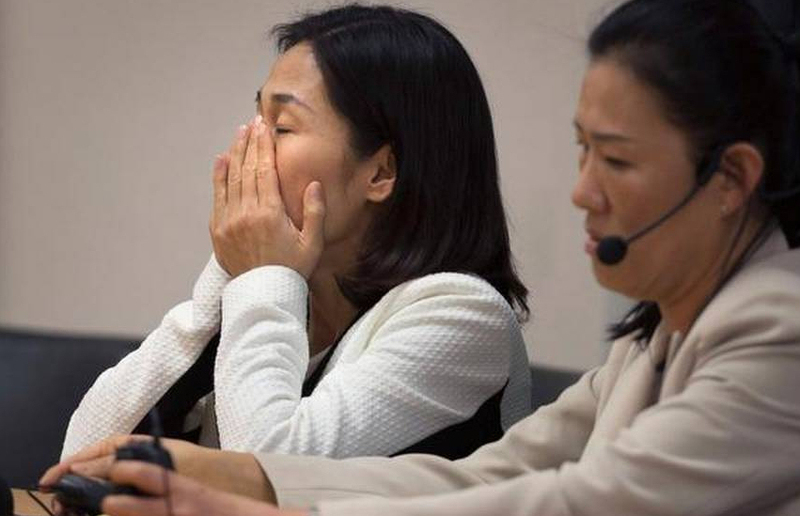 Nan-Hui Jo was taken into custody by ICE immediately following her sentencing hearing and release from Yolo County Jail. She is being processed by ICE’s Sacramento field office to make a decision about whether or not to detain her. She has already spent one night in Yuba County Jail. Nan-Hui has immigration applications pending and yet ICE seems to have the intention of holding her at a detention facility regardless. Call Sacramento ICE Officer Coughlin and tell her office to release Nan-Hui immediately! Please continue to call the San Francisco ICE office as well as San Francisco CBP. Take to Twitter @icegov. Be sure sure to include Nan­-Hui’s identification number (A098 906 641) and hashtag #SarahSaldaña, ICE’s national director. 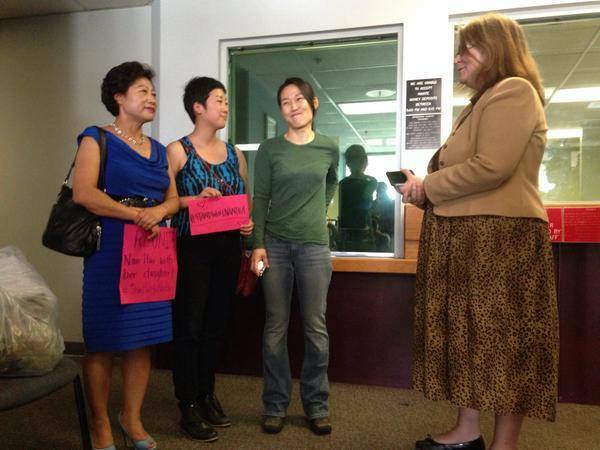 NanHui Jo has upcoming immigration hearing, family court hearings, multiple immigration applications pending. Why is @ICEgov detaining her? Supporters say that after being taken into ICE custody two days ago, Jo was temporarily held at Yuba County Jail for the night, awaiting further transportation to an ICE facility. Additional information as to her current whereabouts are forthcoming. An earlier version of this post was pecked out with a single finger on an iPod, and contained numerous typos and other grammatical errors. It has since been revised for reading clarity.